Dark Souls is more than an expertly crafted series of open-world action RPGs. It's one of the most important games of the past decade, both for the influence it's had on countless other games in several genres, and for launching the career of director Hidetaka Miyazaki, who recently won the lifetime achievement award at the Golden Joystick Awards 2018. Dark Souls is utterly unmissable, and with all the Black Friday game deals going around, now's the time to get caught up. 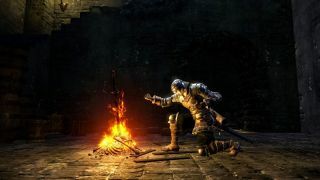 You can get every last ounce of the series for just $60 in this Dark Souls Trilogy bundle on Amazon. This package comes with Dark Souls: Remastered, Dark Souls 2 and its three DLCs, and Dark Souls 3 plus its two DLCs. The base games alone will normally run you more than $60, so with the DLCs added in, this trilogy is an absolute steal. Not only that, it's done up in a stunning steelbook case emblazoned with art from all three games. I mean, I already own everything in this trilogy, and I've half a mind to buy it just for the case. As we said earlier this year, Dark Souls: Remastered is the perfect jumping-on point for Dark Souls newcomers. The remaster smooths over some technical and control issues and polishes the base game's already stunning aesthetic to a mirror shine. Then you have Dark Souls 2, which experimented with some new systems and ideas under the command of new directors, Tomohiro Shibuya and Yui Tanimura, who were hand-picked by Miyazaki (while he was working on Bloodborne at the time). Dark Souls 2 sometimes lacks the grandeur that made the original Dark Souls so memorable, but it's still a fine action RPG, and its DLCs - especially the Crown of the Ivory King - really brought it full circle. Finally, you've got Dark Souls 3, which recaptures the brilliance of the original game, spices it up with some ideas from Dark Souls 2 (and Bloodborne), and delivers the best combat in the series. Dark Souls 3 was a great game on day one, and both of its DLCs are also fantastic. Ashes of Ariandel is a nightmarish and nostalgic adventure, and The Ringed City is arguably the toughest challenge in the series - which is finally finished, at least for now.